Cyril Neveu for Honda and Hubert Auriol on a Cagiva were the two main favourites for the 1987 edition in the bike category. In the overall rally roll of honour, the man nicknamed “The African” and a two times winner behind the handlebars of a BMW was hot on the heels of Neveu, who boasted four titles including the very first edition. 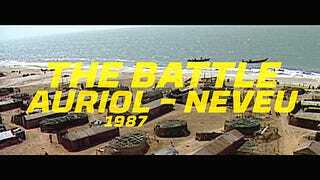 However, this year, Auriol took the lead, won four stages and opened up a gap on his rival, who nonetheless was not giving up without a fight. 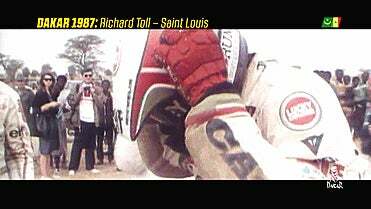 The day before the finish of the rally, he again dominated the general standings by hurtling out of the starting blocks along the tracks leading to Saint-Louis. His dreams of victory were crushed by a fall only 20 kilometres from the finishing line. Due to the violence of the crash, Auriol broke both ankles, but dug deep to find the courage to climb back onto his bike and reach the end of the stage before officially withdrawing from the race, paying tribute to an equally shocked Neveu: “Cyril is the best. I’m giving up biking”. After his recovery and ensuing reconversion, in 1992, he became the first competitor to win the car category after having won on two wheels.